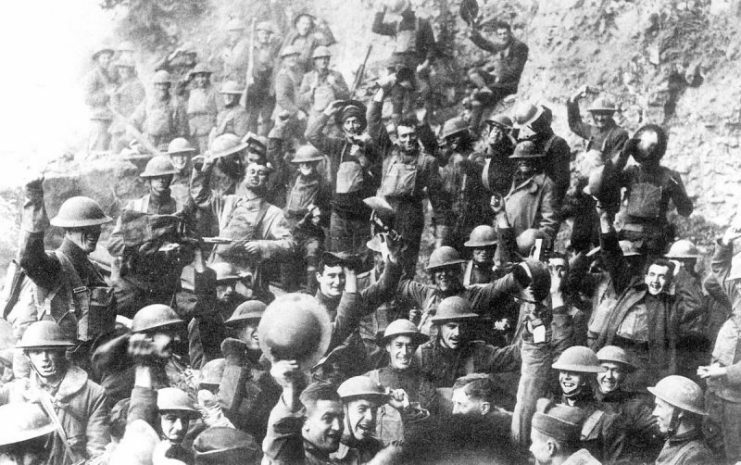 The National WWI Museum and Memorial will capture the world’s attention with activities for all ages to commemorate the end of the war, beginning Nov. 1 through the centennial of the World War I Armistice on Nov. 11. Highlights will include Peace and Remembrance, a spectacular illumination of America’s official World War I Memorial beginning at 7 p.m. on Friday, Nov. 2. The lighting display will continue for nine consecutive evenings leading up to Armistice Day on Nov. 11 to recognize the 9 million soldiers who made the ultimate sacrifice during the Great War. Comprised of nearly 55 million pixels to cover the Memorial with red poppies – a traditional symbol for commemorating military personnel who died inspired by the World War I poem “In Flanders Field” — the display will be created by DWP Live, a stage and special effects producer for major artists including Adele and Beyonce as well as Super Bowl halftime shows. 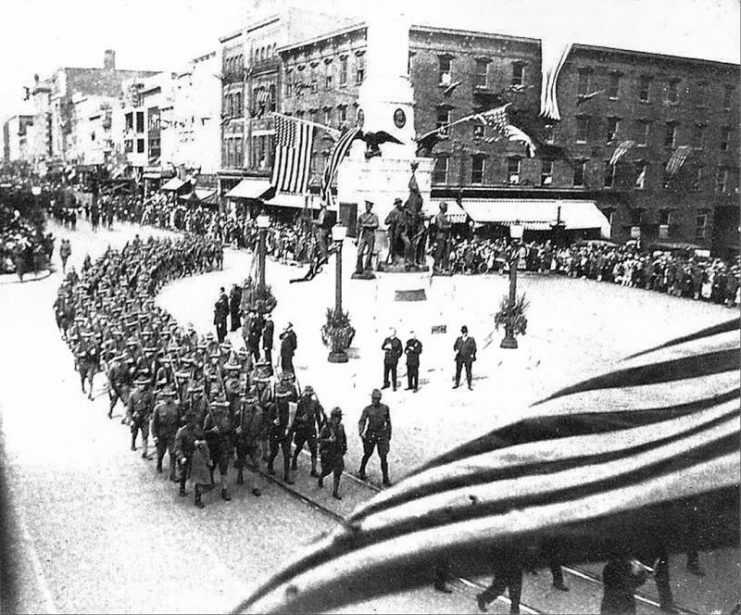 Armistice Day Parade, 1918, Allentown PA. 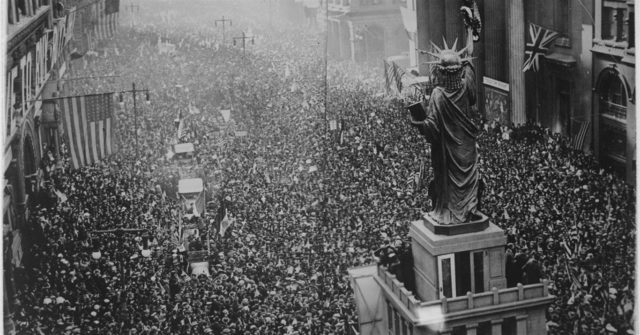 The announcing of the armistice on November 11, 1918, Philadelphia. What: The official WWI memorial of the United States will be illuminated with a nearly 55 million pixel display featuring more than 5,000 poppies each evening with a massive and moving light installation. Peace and Remembrance occurs for nine days leading up to Nov. 11 in recognition of the nine million soldiers who made the ultimate sacrifice during the war. The United States World War One Centennial Commission is the presenting sponsor of Peace and Remembrance. FREE to the public. 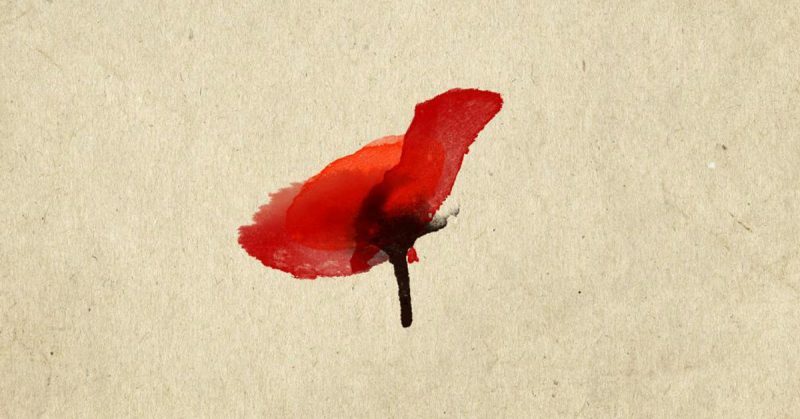 What: Commemorate the Armistice by creating your own felt poppy pin or ornament in this family-friendly craft experience. FREE to the public. What: Join us for a multi-national commemoration of the Armistice of 1918 featuring moving readings of poems and letters from soldiers, musical performances and more. FREE to the public. What: Exactly 100 years after fighting ceased in Europe, organizations across the globe participate in a traditional bell tolling to commemorate this momentous event. Those unable to attend the ceremony are also invited to toll bells at 11 a.m. on Nov. 11 to honor those who served. Collectively, the sound of bells represent this incredible moment of peace. The bell used for this ceremony was originally located at one of the federal buildings in downtown Kansas City and was rung daily by the Daughters of the American Revolution during U.S. involvement in WWI (1917-1918). It was also tolled 11 times at 11 a.m. on Nov. 11, 1926 during the dedication ceremony of the Liberty Memorial. FREE to the public. The National WWI Museum and Memorial will be open on regular days/hours during the Armistice commemoration with the exception of Sunday, Nov. 11 (9 a.m. – 5 p.m.). To accommodate expected high attendance, additional parking will be available on the Southeast lawn of the complex (weather permitting). Visitors seeking to view the Peace and Remembrance illumination are welcome to use available parking on the Museum and Memorial grounds.